Many changes will be occuring to Transperth’s bus network on Sunday 18th of Deember. 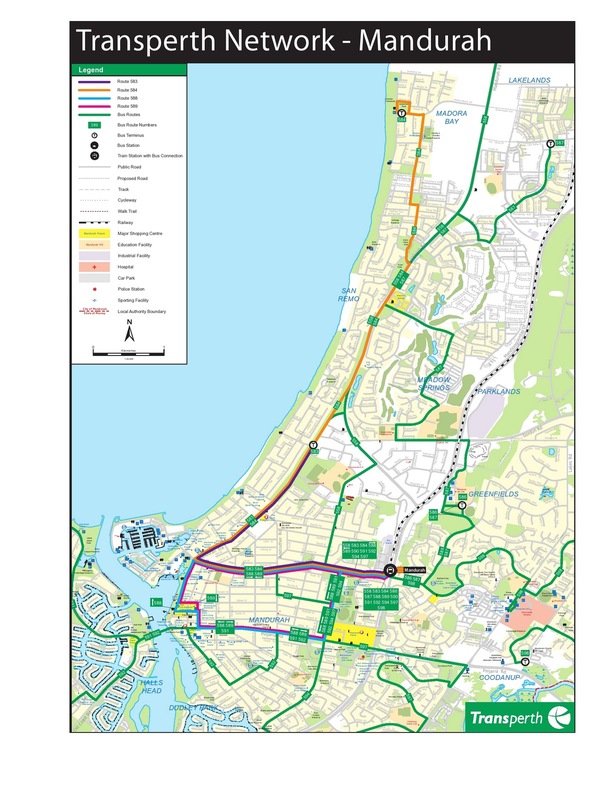 Some of these changes will be to the Mandurah area. In short the deviation to the Mandurah foreshore and Mandurah Centro shopping centre made by the current 588 and 589 will be removed, with a more direct path for buses from that area, and two circular routes (one in each direction) will serve the shopping centre and foreshore area. The current 588 (serving Silver Sands) and 589 (serving Madora Bay and Silver Sands) will be replaced by the 583 and 584. They will travel straight from Mandurah Tce along Peel St and Alnutt St to Mandurah train station, making travel to the station quicker (by about 5 minutes). Passengers from Silver Sands or Madora Bay to the foreshore or shopping centre will lose out on a direct trip, but this will be mitigated by an easy transfer at Mandurah station to the two new Mandurah Shuttle loops, both serving the Mandurah foreshore and Mandurah Centro. These will take on the 588 and 589 route numbers, the former for the clockwise direction and the latter for the anti-clockwise direction. These routes will also be operated wholly on low-floor accessible buses, improving the experience for both disabled and able-bodied passengers. There will be no changes to the other bus routes from Mandurah station (558, 586, 587, 591, 592, 594, 597 and 598), but the proposed changes are on the whole an improvement to Mandurah’s bus services. Timetables for the 583 and 584 are available online now. The 588 and 589, according the Transperth’s article, will be placed on the Southern 135 timetable, but this contains unrelated routes, and no updated version is available, so this is hopefully a typo. Physical timetables will be available from the Tuesday 13th December. P.S. If you have sharp eyesight you may have also noticed that the 590 is on the map of the changes, although it is to be replaced by the 588 and 589. Transperth really hasn't double checked this time. Yep, 135 was a typo all along... should be 136.